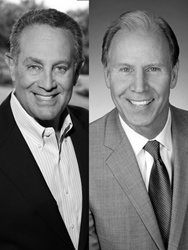 Haute Residence welcomes prominent real estate agents Mark L. Nestler and John R. Poletto to its invitation-only real estate network. As Haute Residence partners, Nestler and Poletto exclusively represent the high-end real estate markets in Boca Raton and Delray Beach, Florida. Nestler and Poletto’s successful real estate partnership goes back to 1989, when they established what would become one of the most acclaimed and successful luxury real estate firms in South Florida. With a mission focused on incomparable client service, Nestler and Poletto quickly gained recognition both locally and nationally for their marketing excellence, and sales success. Soon, they received an invitation to become the exclusive Sotheby’s International Realty franchise in the greater Boca Raton and Delray Beach areas, providing the partners an even greater opportunity to cultivate their customer-centric approach to real estate. In the years since the inception of Nestler Poletto Sotheby’s International Realty (NPSIR), Nestler and Poletto have continued to serve the Boca Raton and Delray Beach luxury home market in award-winning fashion. The realty firm specializes in representing only the most exclusive of estates, country club communities, Intracoastal properties, oceanfront homes, and luxury condominiums. As residents and members of the very communities they work in, Nestler and Poletto, along with their team of real estate professionals, possess the deep community knowledge to offer advice and insight into the area’s luxury possibilities. In addition to sales, over the years, NPSIR has also grown physically. Today, the firm has two offices that can be conveniently reached from anywhere in Palm Beach County. The primary offices reside in the heart of Boca Raton, nestled between Federal Highway and South Florida’s nautical bloodline, the Intracoastal Waterway. The second office is located in Delray Beach, from where the firm can serve clients from farther north. Even after 28 years, NPSIR continues to expand, catering to high-end real estate buyers and sellers from Hillsboro Mile to Manalapan. Furthering its ambition to provide an all-inclusive experience, NPSIR offers full-service mortgage and title services. It also maintains relationships with local moving and storage businesses, professional interior designers and contractors, and can recommend certified mold and air quality inspectors.